Welcome to The Islands! Our 3 bedroom condo is located perfectly on the 6th floor offering stunning gulf views and a fabulous location! Enjoy our incredible views from every window in the condo, including your kitchen and dining room windows! The newly renovated kitchen features updated counters, cabinets and gorgeous tile backsplash will inspire you to create gourmet meals. The condo features 2 King size beds and 1 Queen that will keep you and your guest happy and comfortable! The Master bathroom features a handicapped accessible shower following a beautiful vanity in the next room with a sink that opens into a very spacious walk in closet! The Enclave is a favorite complex because of its Scenic 98 location, community pool, two tennis courts, private deeded beach access, volleyball court, and a community clubhouse that is available for rent. No detail has been overlooked in our comfortably decorated 3-bedroom gulf view condo. 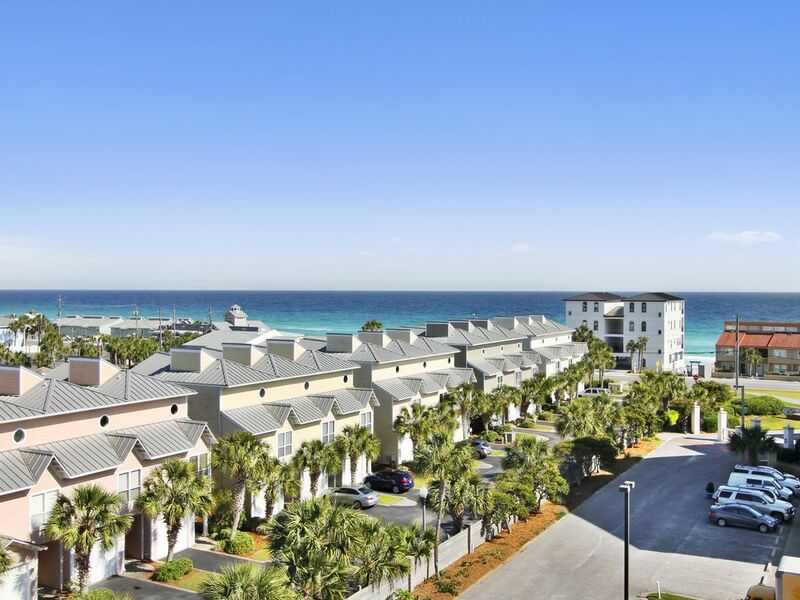 Located in one of Destin's best kept secrets, The Enclave, you are close to all that Destin has to offer. If you're looking to kick back and relax in a homey atmosphere, The Islands at Enclave 605B is the place for you! The kitchen is clean and inviting with fresh white cabinetry. This property is so unique and special....A kitchen wall was removed which completely opens the kitchen and a kitchen island was added. In addition, above the kitchen sink is a window with stunning gulf views! Interior walls throughout the condo have been freshly painted with soft and fun, tropical colors which ties in the true Destin ambiance. The extra-large tiled balcony extending from the dining room is complete with outdoor furniture, which serves as the perfect spot to relax and enjoy the balconies amazing view of the pool, gulf and the lush landscaping of the complex. The spacious bathrooms have been upgraded with gorgeous textiles and the Master Bath is handicap accessible. The carpets have been replaced with tile flooring in the entire condo excluding two bedrooms. Ceiling fans are in every bedroom and the living room. A brand new sleeper sofa and love-seat were added to this condo in March 2019, which now accommodates sleeping for 8 Guests. This condo has some of the best views of the resort with views from 3 sides! During the Summer, enjoy views of the weekly firework shows and come 4th of July....the condo has views of the Destin Commons Fireworks, Baytowne and even the Destin Harbor! Talk about a night to remember! The Enclave is a favorite complex because of its Scenic 98 location, community pool, two tennis courts, private deeded beach access, volleyball court, and a community clubhouse that is available for rent. The condo was great ! The location was wonderful. We enjoyed our trip to Destin, mainly because we were there during the least-busy time of year. The condo was comfortable and met our needs. If you're looking for a great view or plush surroundings, this is NOT the place for you. There are two windows that have a small view of water over rooftops. The furnishings are eclectic, but comfortable. Nothing matches. We played games a lot, and the dining room table is a perfect place for that! The bedrooms and bathrooms are very comfortable, useful and nice. The shower in the master bedroom is especially great! The beds are all very comfortable, as is the furniture in the living room. Be sure to take extra toilet paper, paper towels, dish soap, etc. because there's a bare minimum of these products in the condo. The parking was NEVER a problem, even though we had two vehicles. The entrance to the property is a bit hidden, but it's easy to find after the first time. All in all, I would recommend this place so long as you're not looking for beachfront property. Clean, quiet, beautiful view. Set up perfect for family. Privacy and large common gathering area. This is probably the best condo rental I have ever had in Destin! The unit is clean, welcoming, spacious along with a beautiful Gulf view. We had five family members staying in the condo comfortably. With three bedrooms, two baths and a great living room, dining room and kitchen space all open to each other this roomy condo is a gem!! Thank you Tim for your review! It really is a great condo! We hope to help you book another vacation next year! Great place to stay. Located close enough to everything. My family felt very comfortable. Good rate. Lots of space. Close to everything. Thank you David for your review. We are glad you enjoyed your stay, and look forward to helping you plan your next trip!